In Textales Dream Bear edition, that is told and illustrated by Kerstin Zabransky the sleepy bear goes wandering around the forrest. Kids can follow the story narrated by their parents and find out how the Dream Bear encounters among other adventures a star, fish, rabbits and an owl. The woven textile design is refined to each story element. 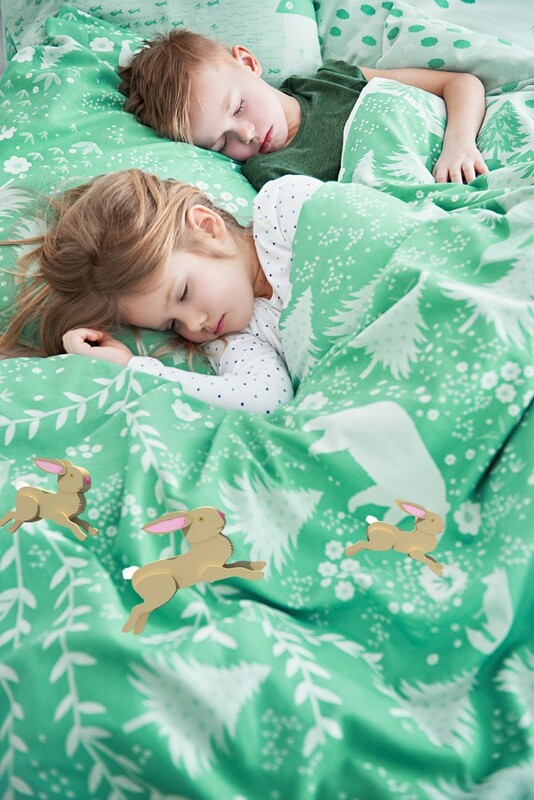 The tablet or smartphone application, accompanying the duvet cover and the pillow case, adds an extra layer to the tale by revealing magic characters. 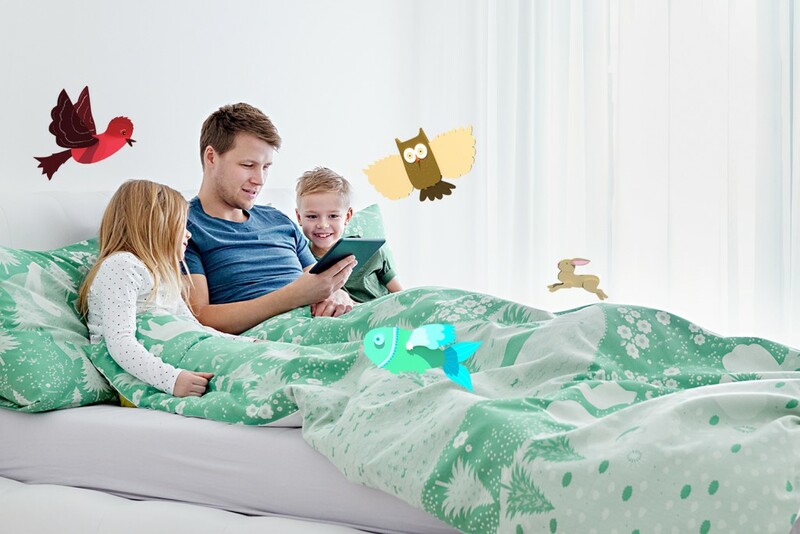 The owl, star and other 3D characters appear in augmented reality application with sound effects on the cloth after the textile has been scanned with the smart device. 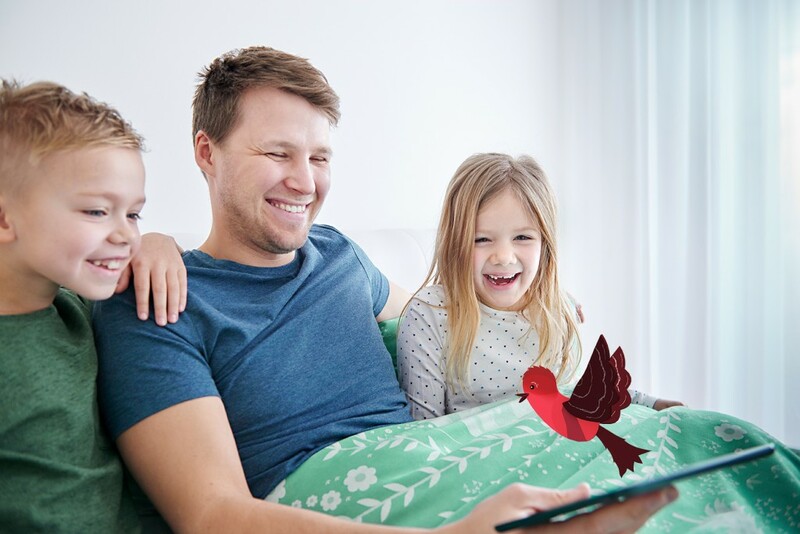 Textales Dream Bear edition allows the parents to share stories with their kids. The shared tales can be personal experiences subtly woven into the bear narrative, the original Dream Bear adventures or creative imaginations based on the randomly appearing characters of the story. To achieve each of the experience, Textales application has a separate setting for the storyline behaviour: “Narrative On”, “Narrative Off” and “Narrative Random”. Textales is a project in the intersection of textile tradition and technological innovation. With Textales the storytelling through traditional textile and augmented reality fairy tale application is explored. Digital properties extend the textile capabilities and allow the long-lasting textile to change in time to follow the pace of life of the users. The developed stories demonstrate the possibilities for such storytelling. Textales project is rooted in Kristi’s research about craft values and sustainability. The aim for connecting digital dynamic properties with high quality textile is to extend the longevity of textile products through changing the idea of what textiles can do.